SEOUL, Jan. 23 (Yonhap) -- The U.S. government has demanded a 41 percent hike this year in South Korea's contribution toward the stationing of American troops here, while Seoul insists on a small increase, a diplomatic source said Wednesday. 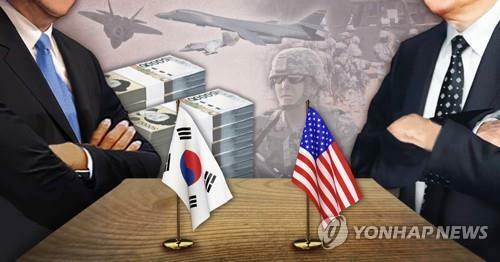 The U.S. is also calling for a one-year contract, versus Seoul's desire for it to last three to five years. Last year, the allies had 10 rounds of talks, led by veteran diplomats, on splitting the financial burden for the operation of the 28,500-strong U.S. Forces Korea (USFK). But they failed to strike a deal. Seoul contributed 960 billion won in 2018 under a five-year accord signed in 2014. The U.S. recently "asked South Korea via a diplomatic channel to pay up to $1.2 billon" (1.35 trillion won), according to the source. This would mean a 41-percent hike on-year in Seoul's contribution. Washington said it can't accept an amount below US$1 billion under any circumstance, citing a "guideline" from the highest leadership, the source added. "South Korea has maintained a position that the size (of its contribution) should not exceed 1 trillion won, the psychological Maginot Line of its people," the source said. Earlier this week, Foreign Minister Kang Kyung-wha told reporters that there's a "very big" gap between the two sides on sharing the cost of the USFK. U.S. Ambassador to South Korea Harry Harris visited the presidential office, Cheong Wa Dae, in December to deliver Washington's position on the issue. Since 1991, the USFK has used South Korean taxpayers' money to fund wages for South Korean workers, construction of base facilities and logistics. Last month, President Donald Trump openly criticized some allies for what he views as a free ride on the U.S. for national defense. "We are substantially subsidizing the Militaries of many VERY rich countries all over the world, while at the same time these countries take total advantage of the U.S., and our TAXPAYERS, on Trade," he tweeted. A new Special Measures Agreement (SMA) with South Korea will be the first major U.S. defense-cost deal with an ally under the Trump administration. It may affect Washington's similar negotiations with Japan and NATO next year.